Inspired to provide healing in three mechanisms of action through the various ingredients based on scientific literature and antedotal reports. People have given feedback that the onset of pain relief is about 5 minutes and the duration of localized effectiveness ranges from 2-4 hours. Contains a variety of essential oils which potentiate and play well with each other including lavender, peppermint, helichrysum, wintergreen, turmeric & German chamomile. The fragrance of this oil is incredible and the color ranges from blue to green depending on the size of my batch bottle. Simply apply the affected area with several drops of PRI and rub into the skin. Works locally to relieve pain, reduce inflammation at a noticable level. 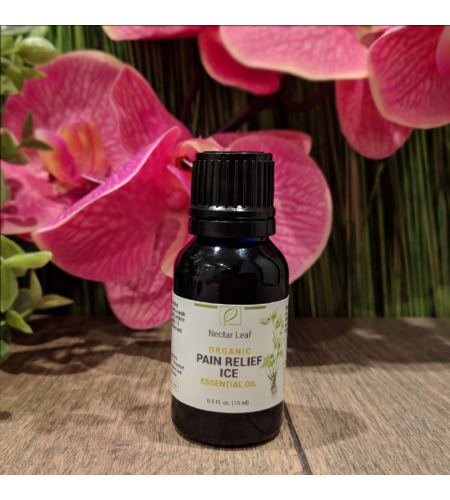 Proprietary blend of organic & rare wild-crafted essential oils from all over the world, healing frequencies charged with activated plates infused in fractionated coconut oil, Pain Relief ICE is truly a magical formula with your healing in mind.